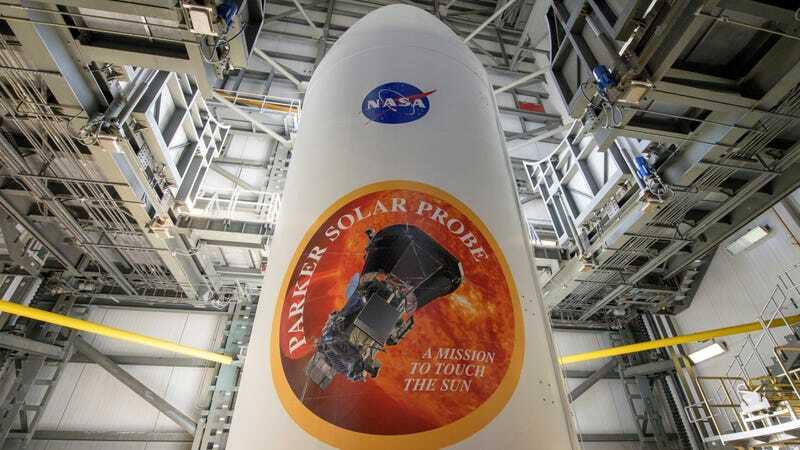 The Parker Solar Probe blasted off from Cape Canaveral Air Force Station in Florida on Sunday, setting itself on course to become both the fastest human craft ever launched (in the neighbourhood of 430,000 miles per hour) and the first to probe the outer corona of the sun. Per the BBC, NASA has since confirmed the probe successfully separated from its rocket and is proceeding on its mission as intended. The $1.5 billion Parker probe will pass by the sun as close as 3.83 million miles from its visible surface, the photosphere – a number that sounds large in absolute terms but is nonetheless close enough to the star to expose it to temperatures of nearly 2,500 degrees Fahrenheit (1,377 degrees Celsius). According to NASA, the spacecraft is protected from solar radiation by a 4.5-inch-thick carbon-composite shield, which despite weighing just 160 pounds should allow onboard instruments to operate at room temperature even during the most intense parts of its journey. The probe also carries a memory card with the names of more than 1.1 million people who submitted their names to NASA. The craft is named after 91-year-old University of Chicago astrophysicist Eugene Parker, the first to develop theories about the solar wind. Parker was on hand for the launch. The other mystery is how the corona ranges between 1.8 million to 5.4 million degrees Fahrenheit (1-3 million degrees Celsius), far hotter than the surface of the sun itself. Previous explanations have included magnetic fields and atmospheric “tornadoes,” though the Parker probe’s close flyby should help resolve the question. Understanding the solar wind is of importance to scientists and policymakers because of its potential to devastate civilisation. Occasionally, a huge explosion, called a coronal mass ejection, erupts from the sun, sending a larger-than-usual deluge of particles into space. In 1859, one of those explosions made a direct hit on Earth, disrupting telegraph wires in America and Europe. If the same thing happened today, it could cause continentwide blackouts, potentially requiring months to years to repair. In 2012, one of NASA’s sun-watching spacecraft, Stereo-A, detected an explosion comparable to the 1859 explosion. Fortunately, it was not aimed in Earth’s direction.